What a surprise to find someone who went to Chells school in 1965. Yes i do remember you Timothy and yes i lived on the corner of Newton Road not far from the garage. I have left a message on the Chells School facebook page hoping to find others. Would be nice to hear what you have been up to all these years past, if you had an email address you may be-able to post it on my facebook page it’s the one with the cheetah. I have read your post (Frank Hughes) i do remember you. I also attended Chells school starting September 1965. Also went on the Switzerland school trip. I think you lived on chells way near Amoco garage (I may be wrong). I still live in Stevenage area. I started at Chells in September 1965. I googled it the other day (i5/01/ 2019) what have they done to it, only recognised the caretakers house, was nice as it was when it was first built. Looking for past pupils from that start time, tried facebook, chells facebook page and friends reunited but no luck. You must be out there somewhere???????????? I attended Chells in the mid 60s, remember watching them film ‘Here We Go Round The Mulberry Bush’ on way home from school. Fond memories. Remember also a 10 day trip to Switzerland. Happy days! 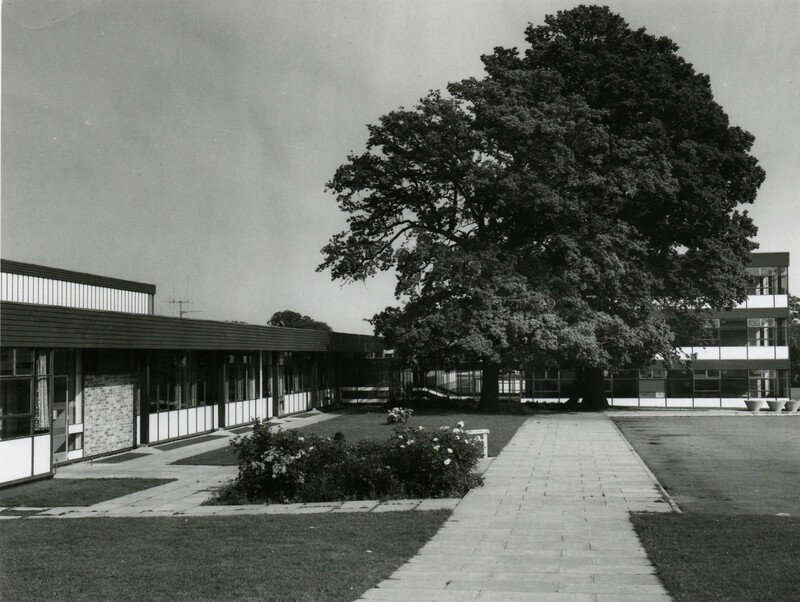 The only “original” things left from the old Chells school site are the oak tree pictured, the caretakers house and the playing field. every thing else has been redeveloped. I started at Chells school in September 1963 and I was part of the first intake of about 60 children. Chells School did not merge with Nobel School in 1983, or at any other time. In fact, from September 1980, and using current terminology for school years, year 8 transferred to The Bedwell School. There was no year 7 intake to Chells that year – most who would have gone to Chells went to Bedwell. Years 9, 10, 11 stayed at Chells and the last cohort therefore finished at Chells in July 1983. At this point, any intending sixth formers went to other schools, usually Bedwell. The Bedwell School took (by permission of Hertfordshire County Council) equipment etc. it needed to their site. The site itself was vacated and The Nobel School moved into it from September 1983, thereby combining on that site, where it still is,from its previous two sites in Telford Avenue and Six Hills Way. As for when this Chells School site opened, I believe it was September 1963, because a cohort of students did start at that site at that time. It might have been September 1962 that the building opened, so the 1963 intake might have been either the first or second cohort into the school – I can’t remember! Thank you for the information! At the time when this undated photo was catalogued by the Museum, this was its best guess. Chells School seems to have had several moves and mergers! hi this school was built about 1964, so this picture date is wrong, as there was nothing there in 1960,i live in chells from 1960 untill 1979.